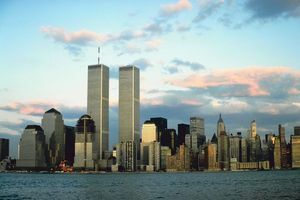 1 America was shocked on September 11, 2001. Terrorists attacked and destroyed the World Trade Center using passenger airplanes. There were 2,992 people killed in this attack. It was a terrible disaster. What many people forget is that there was an earlier attack on the same building. The earlier attack took place on February 26, 1993. Six people were killed in this first attempt to bring the huge building down. 2 The plan to bomb an important structure in the United States began in the Middle East in 1991. A man born in Kuwait named Ramzi Yousef entered the United States in 1992 using a fake passport. He came with another man who was working on the plot with him. The friend was stopped at the airport in New York. He was carrying instructions on how to make a bomb in his luggage. Yousef was able to sneak through customs and head to New Jersey. Here he got himself an apartment. He was also able to contact other men who would be able to help him with his plan. 3 It was the plan of these men to disrupt the economic and communications systems that were vital to New York. The men hated the United States. Yousef himself emailed his reasons for his hatred to several New York newspapers just before he put his final plan into motion. He wanted the United States to stop giving financial help to the country of Israel. He wanted the United States to stop working with Israel on world affairs. He also wanted the United States to stop getting involved in the governments of other Middle Eastern countries. He called it meddling. He wanted the United States to stop telling these countries how to run their own governments.